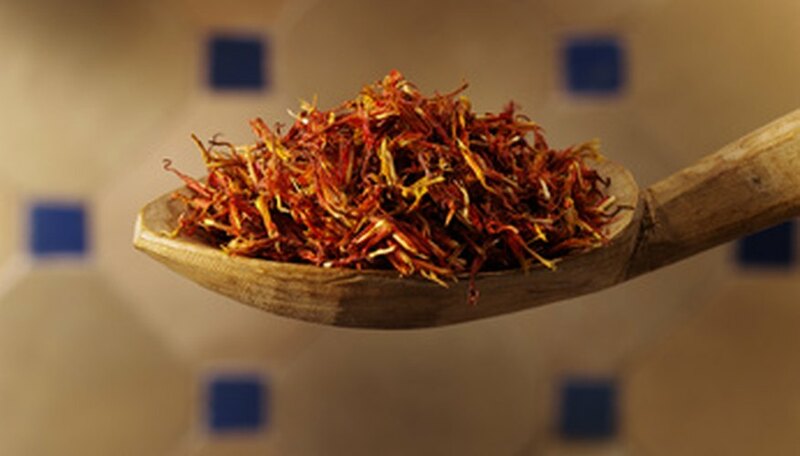 The dried pulverized flower parts of the saffron crocus (Crocus sativus) yield the expensive fiery spice saffron. No longer found in the wild, likely native to the northeastern Mediterranean, saffron crocus is grown in gardens and in commercial fields to yield flowers for harvest. According to White Flower Farm, about 24 flowers are needed to yield enough saffron to flavor a few food recipes. Grow this fall-blooming crocus in US Department of Agriculture hardiness zones 6 through 8, the part of zone 9 that is in the Pacific West. Locate a sunny area of the garden that has a coarse-textured soil and drains well. This means the soil never remains soggy or flooded after a typical rainfall event. Coarse-textured soils have considerable amounts of sand and grit in them, and clay and loam soils can be made more coarsely textured by adding gravel. Consider filling a container with coarse soil if no area in your garden supplies an area with the right soil environment. The container needs to be at least six inches deep and any width, although wider is better. There's little benefit to a very deep container, as it may lead to improper watering. Incorporate lots of organic matter into the coarse soil where you wish to plant the saffron crocus. Add enough compost so that the soil is crumbly but still coarse in texture. Knead the soil mixture with your hands and create a soil that is approximately 40 percent newly added compost. Plant the saffron crocus bulbs four to six inches deep in the soil whenever the local garden center or mail-order nursery provides them to you, most likely spring or late summer. Water the soil after planting, adding enough water to moisten the soil to a depth of six inches. Permit the soil to drain between watering so to never remain too wet. Allow the saffron crocus bulbs to bloom in autumn. The plants will sprout long green leaves that persist over winter and early spring. These leaves die back by summer. Keep the soil quite dry over the summer dormancy of the saffron crocus bulbs. The dormant bulbs underground need a long, hot and dry summer. Shield the soil with thick mulch or other water-shunning material to prevent wet summers from rotting the dormant bulbs. Move containers to a hot, rain-protected area. The key is mimicking the natural climate saffron crocus bulbs endure in their Mediterranean homeland. Resume watering the soil in late summer to help coax the bulbs out of dormancy, but remember to never make the soil soggy wet. Gradual increasing of watering into early autumn will naturally result in the fall flowers to emerge. Even in large commercial fields, saffron crocus tends to be short-lived unless dug up after 1 or 2 years and replanted in fresh coarse soil with fresh compost. Plan on re-working the planting area in late summer and replanting the saffron bulbs or adding newly purchased bulbs. Allow the winter and spring foliage to remain and ripen to yellow. These leaves replenish the crocus bulbs to have energy to flower later in fall after the hot, dry summer dormancy.